For me, this meant focusing on the kind of writing I was good at. As a reader, I absolutely love beautiful, lyrical prose, but as a writer I knew right from the beginning that this sort of writing wasn't for me, nor was it appropriate for the kind of fun, fast, plot-driven books I wanted to write. So, instead of trying to force myself to become something I wasn't, I focused on getting better at my prose by identifying what I wanted from my writing voice. This turned out to be the critical step for me as a new author. Author voice--the phrases we choose, the way we describe things, the manner in which we write--is the main component to creating a book's atmosphere. Cozy and Noir are both sub-genres of Mystery, but the difference in their respective tone is night and day. That tone is created by author decisions at the sentence prose level, and once you've got it, you can't stray too far without risking your book reading like it was written by two (or more) different people. Seeing that, I decided right from the beginning to write in the voice I was most comfortable with, the voice that just came naturally when I started writing scenes in my head. This is what I now think of as "my" writing voice--conversational, funny, clear, and dramatic when necessary, because sometimes life gets serious. But just because I was using the voice that felt the most natural to me didn't mean I was free from trying to improve. These days, I put a lot of work into making sure all my prose sounds like me. Part of this is sticking to the general rules of good writing--basic good grammar, eliminating excessive adverbs, keeping my phrases clear, not trying to get too fancy, all that Strunk and White stuff--but mostly, I try to put myself in my reader's position. At this point, I feel I should say that I never worry about word choice on a first draft. When I'm writing a scene for the first time, my #1 concern is just getting it down. Prose polishing is a job for the edit, because everything you write in a first draft is probably going to get changed anyway. There's no point in killing yourself over detail work on a paragraph that might end up getting axed. So please, don't waste your time fussing over this stuff if your book isn't finished yet!! There will be plenty of time to add this kind of polish once you're sure all your big stuff is in the right place. But when it is time to put the final layer of finesse on a sentence or paragraph, the questions I'm always always asking myself are, "Is this clear? Is this suitably funny/gripping/dramatic? Would my reader like this?" Beyond a basic competency level, I don't even worry about rules of good writing or sentence construction. My focus here (as in every other aspect of my writing) is entirely on reader experience. When I'm fiddling with a paragraph, I like to picture myself standing on a stage reading it to an audience (or telling it to a friend if you have a fear of public speaking) and seeing if I can make them laugh or gasp or whatever reaction it is I'm trying to evoke. I don't write to impress them or show off my skill with words, I write to reach them, to dig past the cynicism of daily life and make them care about my story and characters. If I have to get a little sappy or cheesy (or even break a few rules of good writing) to do that, then I do it, because I'm not a great and lofty artist trying to please an invisible critic. I'm an entertainer, and if I'm not giving my reader the show they paid for, then I've failed my most important job. There are a lot of writers out there who would say this way of writing is pandering to readers, that books should be challenging to read. These people aren't wrong, but they're not right either. The world needs all kinds of books from high lit to rolicking fun genre. There are millions upon millions of readers out there with all different tastes and demands from their fiction, which is exactly why we need so many different kinds of writers to meet those demands. There is no shame in writing fun, entertaining books with quick, funny, straightforward prose. So if you're struggling with your prose and you don't think it's good enough for whatever reason, ask yourself--who are you writing this for? Who is your reader, and what do they want from your book? Find your person, and then write your very best, most creative prose for them. Don't ignore the basic rules of good composition, but don't become obsessed with them either. We're not trying to get a good grade from our English composition teachers here. We're trying to write good books, and that's a lot more open to interpretation than most people think. So to actually answer Tom's question, I actually write exactly as you describe. I plot, I plan, I draft, and then I write. I don't worry about what I'm writing during the first draft because first drafts are for the big stuff. But when the story is all in the right place and I'm happy with everything, that's when I dive into my paragraphs and get all my words into the form I think will work the best for my reader, because they're the person I'm doing all this work for. In the final run of things, if you're writing with your audience's experience first and foremost in your mind, you're already miles ahead of the pack. Just like every other aspect of writing, the secret to strong, good, narrative prose is thoughtfulness. If you take time to think about what you're writing, how best to phrase it, and how your final audience is going to react, then you're already doing the best work you can. It still may not be good enough. I still write paragraphs I'm unhappy with, but I don't let them stay. I do them again, I do them better, because writing is an evolving art. The more we write and practice and learn what makes our voices good, the better and more sophisticated we become. The process is never finished, either. We can always become better writers so long as we never stop writing. And thus concludes another Writing Wednesday! I hope you enjoyed it, and thank you to Tom for asking such a fun question! If you have writing questions you'd like me to answer on the blog or in private, you can write me through my website or just ask me on social media (Twitter / Facebook / Tumblr / Google+). I do new writing posts every Wednesday plus fun stuff in between (such as this post I put up on Monday about self pub numbers and money), so please subscribe to the blog or follow me on any of the social media links above for more writing shop talk, book deals, and other authorial fun! Thank you as always for reading, and until next time, Happy Writing! I think Tom is right to 'wing it' at the level of the paragraph / sentence. Too much planning at that level would kill the style for most writers, I think (though I'm sure it works for some people). If you watch an artist sketching a picture, they don't tend to focus on little details right away, they attack the paper with broad, swift strokes, letting instinct guide their hand and allowing a certain freedom with the lines (which they can always erase or amend later). Holding the pen loosely is a good way to let the creativity flow out... you don't want to throttle it. I also think you shouldn't go for style just for style's sake - just to show off how elegant your writing is. Any art or craft should be there to enhance the experience for the reader - not the reputation of the writer. It's like fancy guitar solos. Some of them show off the music, but others just show off how fast the guitarist can move his fingers. I got a kick out of this post because it reminded me that my sister says that writers are either born with a 'clever plotting gene' or a 'beautiful language gene'. Of course it's partly a joke, but there seems to be an element of truth behind it. Just as you say, everyone has different strengths, and if you think about it, most writers clearly fall into one category or the other, even if they've learned to become quite competent in the area that isn't their strongest suit. I think it's been a few years since I first discovered your blog, and though I don't believe I've commented before, I always find your posts charming and fun, and often full of wisdom. It's also interesting to see that although some of the issues you discuss are specific to the kind of books you write, most of it applies to writing any kind of fiction. So I thought it was funny that you mentioned Le Guin, since she's my favorite author and one of my biggest influences -- I also write fantasy and science fiction, but these days I think many people would describe what I write as literary fiction that also happens to be SF or fantasy, so that would put me on the flip side of the coin. I'm sure you've always had the ability to conjure up exciting, twisty plots, while plotting has never been my strong point. Instead I've frequently received compliments on the beauty of my writing (even as a kid I could pull off some very lyrical descriptions). And I think you have the right attitude here -- of course there's a place for all kinds of books in the world, but as a writer you have to find the niche that plays to your strengths. For instance, I've had to accept that even though I enjoy a good mystery, it would be a big challenge for me to come up with one! I've long thought that books with engaging characters and compelling plots were just as much literary art forms as beautiful language. To write a book that totally engages the reader, where the writing evaporates and there is just the story, is an art and craft of its own. 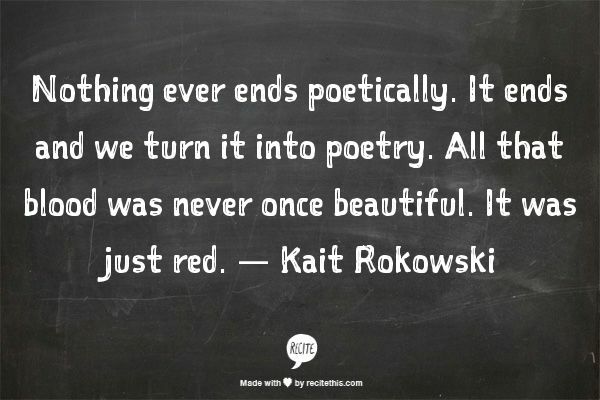 Of course, prose doesn't have to be 'poetic' or fancy to be considered strong or beautiful. Hemingway is the famous example of very spare, simple language. Strong prose simply means choosing the very best words to do the job in hand, so your writing is the most efficient machine it can be. Hi Rachel, thank you so much for taking the time to answer my question! And sorry it's taken me so long to reply. As you said in your post, reconciling the desire to write beautifully - versus actually just getting your story onto a page - can be tough. I've suspected this dilemma is familiar to authors everywhere, but it was lovely to hear you address it so honestly, with such introspection. I enjoyed your 'suppressing the inner editor' post too, I am guilty of way too much time-wasting perfectionism on first drafts!